Rosewater or more often known as ‘Gulab Jal’ is a by-product of the production of rose oil. It is one of the most used ingredients in perfumes, cosmetics, food and also medication preparations. Since the ancient times, Rosewater has claimed to be highly prized for its source of perfume, medicinal use, and nutritional properties. Its importance and potential in the skincare regimens is unmatched. 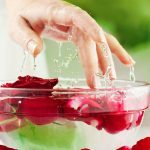 Rosewater is known to help the skin maintain its pH level, and when used as a toner and cleanser (1), it helps the skin bound with the goodness of the world. What Are The Rose Water Benefits? Rosewater is said to stimulate the circulation of tiny blood vessels underneath the skin, thus helping reduce the appearance of thread veins and broken capillaries (2). Gulab Jal maintains skin’s pH balance, calms acne, dermatitis and eczema. Smoothens, moisturizes, hydrates and revitalizes the skin while healing scars, cuts and wounds. Helps calm the skin and spirit thus easing stress and anxiety. Rosewater for face helps tone the skin, while offering anti-bacterial properties. Its antioxidants properties help strengthen skin cells and regenerate skin tissues (3). Helps revitalize the aging skin, thus keeping fine lines and wrinkle at bay (4). Rose water helps in removing excess oil from your skin when used as a toner. It works similarly on your hair too. Some people have very active sebaceous glands, which secrete a high amount of sebum, an oily substance in the scalp, at the root of hair strands. This sebum can make hair feel greasy and oily, which not only looks unpleasant, but also makes it easier for dirt to attach to the hair. So, to prevent greasy hair, rose water can be used. Rose water’s pH is closer to the pH of your hair, which means it can reduce the oil and restore the natural shine of your hair. To remove oil, take rose water on a cotton ball and rub it on your scalp by parting your hair. You need to be patient to cover your entire scalp. Once it is done, wash your hair with rose water to remove whatever excess oil is present in it. This is a very effective method, and unlike the oil-removing shampoos, it does not leave your hair dried and frizzy. Rose water helps in controlling oil, but it also works well on dry and frizzy hair. Rose water can soothe the scalp and moisturize it. Dry scalp ultimately leads to dry hair, and hence rehydrating the scalp really does the trick of eliminating frizz. To get the maximum benefits, use glycerin along with rose water as the former enhances rose water’s moisturizing ability. To make a solution, mix equal parts of glycerin and rose water. This slightly viscous liquid has to be massaged onto your scalp and hair. Let it stay for 15 minutes. After that, rinse it well. Repeat once a week for best results. Rose water indeed helps in conditioning your hair. Sometimes shampoos leave our hair dry and almost crunchy after cleaning it. This is a common problem because most shampoos contain several chemicals that may not suit our body and its pH. To solve this problem, you can use rose water. All you need to do is simply do a final rinse with a cup of rose water at the end of shampooing. It deep conditions your hair and leaves it shiny throughout the day. Also, rose water leaves an sweet, exotic scent in your hair that no conditioner or shampoo can replicate. You can make your own rose water conditioner. Good quality pure rose water contains the essential oil of rose and water. So, you can skip the water and use the rose essential oil itself. Add 10 drops of rose essential oil into a cup of light coconut oil and stir. Coconut oil is a good conditioner and together with rose oil, it does wonders to your shampoo frazzled hair. There are many ways in which our hair gets damaged these days. Pollution and dirt are our worst enemies, followed by chemical hair products and even heat. We are always in a hurry, and hence, air drying washed hair is not an option for many. Blow drying hair often leads to severely damaged hair. Rose water helps in treating damaged hair and to some extent, can even reverse it. To boost the damage reversing properties of rose water, you can add vitamin E and jojoba oil. 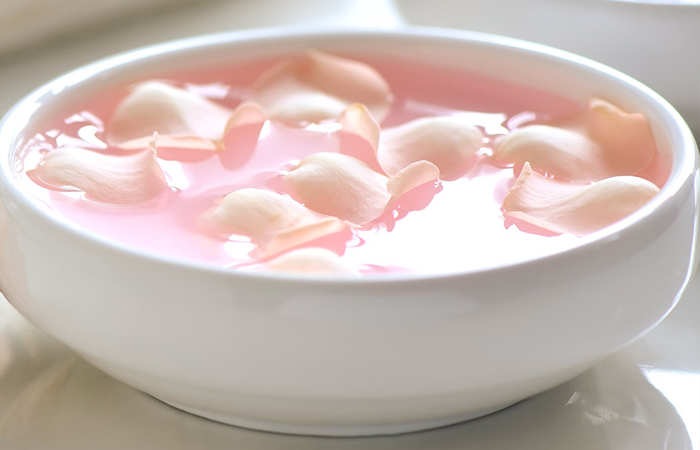 In a cup of rose water, empty the contents of 3 vitamin E tablets and a teaspoon of jojoba oil. Shake well to mix the ingredients well. Spray your hair with some water, which makes it easier to apply the rose water mixture. Now massage the rose water on your entire hair and scalp. You can leave this overnight and shampoo in the morning as usual. Is rose water good for hair growth? Although there is no scientific proof suggesting a link between hair growth and rose water, some have reported such a finding. To be sure, rose water does contain vitamin A, vitamin B3, vitamin C and vitamin E, all of which are responsible for boosting hair growth. To incorporate rose water into your hair growth remedy, simply add rose essential oil to all of your hair products. Your shampoo, conditioner and oil can all be added with rose essential oil. In fact, if you are trying to promote hair growth, make conditioner and shampoo at home using natural products and add rose essential oil to it. The shampoo and conditioner can be made similar to the recipes given below. Does your hair break easily? Has it degraded in quality? There could be various reasons behind reduced strength of hair. But to improve it, you can use rose water. The ancient Chinese used rose water as a hair strengthening remedy. What rose water does is increase circulation of blood in the scalp. Increased blood circulation rejuvenates the hair follicles and makes them strong. This, in turn, helps in better exchange of nutrients from scalp to the tip of the hair. As a result, reduced hair breakage and improved hair quality can be expected. You can use rose water on hair in several ways. First of all, you can try making your own rose water shampoo or conditioner. Otherwise, a good rinse with rose water every few days would also help. You can make the vitamin E and rose water mixture and apply it once a week. Dandruff can be very annoying and persistent at the same time. But instead of barraging your scalp with heavy duty chemicals that usually anti-dandruff shampoos contain, you can turn to rose water. Unlike the chemically enhanced shampoos, rose water moisturizes and leaves your hair well conditioned. To get rid of dandruff, make use of fenugreek seeds along with rose water. Soak the fenugreek seeds in rose water for a few hours until they become soft and mash them into a paste. Take this liquidy paste and apply all over your scalp. Let it sit for an hour and then shampoo as usual. It should solve your dandruff problem if applied once a week. Rose water is said to have anti-fungal and anti-inflammatory properties. So keep infections at bay by rinsing your scalp with rose water every few days. You can make your own shampoo and conditioner with rose water. If that is too much of a hassle for you, you also dilute your hair care products with rose water. If it is easily available for you, adding rose essential oil always helps. As we have already mentioned, rose water helps in increasing blood circulation in the scalp. As a result, the general scalp health is improved, and dandruff, oil, fungal infections and other such problems that originate in the scalp are greatly reduced. You can massage your scalp with rose essential oil and any carrier oil like jojoba oil to get the maximum benefits. Simply dabbing rose water on your scalp would work nicely too. All you would need is few rose petals, the consumable ones, and not the ones the florists offer. Wash those rose petals and boil them in some clean water. Once the petals turn white and once the water retains the flower color, cool it and refrigerate it. 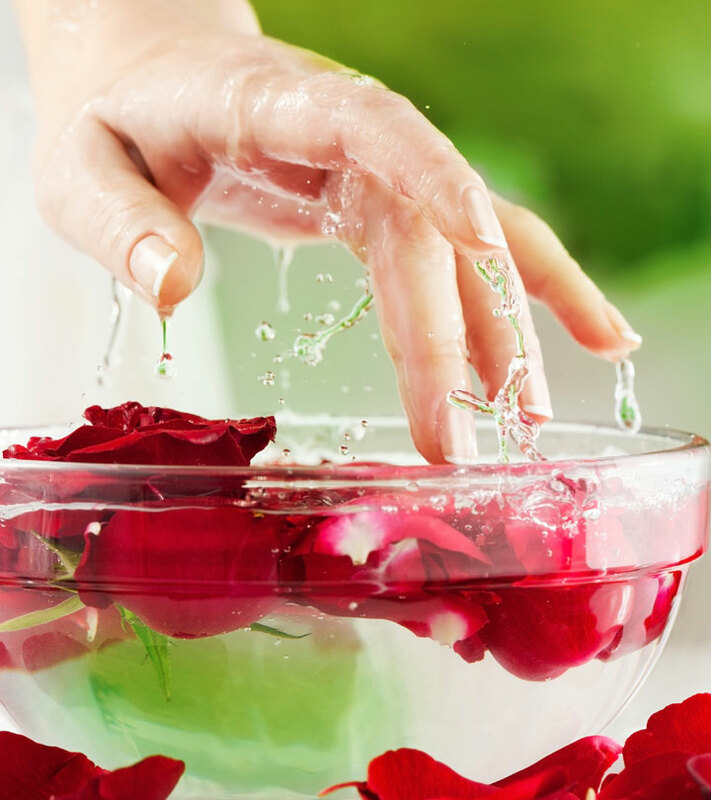 This homemade rosewater can be used anytime to achieve a calming and soothing effect. Homemade Rose Water Shampoo: Mix three eggs with quarter cup each of rum and rose water, to make this into a shampoo to wash your hair. Finally rinse it with diluted vinegar. Castile Soap And Rosewater Shampoo: To make the shampoo, mix ½ cup rose water, ½ cup beer and 5 drops of rose essential oil together, adding castile soap in the end and stir this to incorporate. The rose water helps in cleaning while beer is great for silky hair. The essential oil soothes your scalp and nourishes hair. Adding rosewater to your last hair rinse will offer soft and shiny hair. Nourishing and moisturizing properties recover the quality of hair. Down to its natural anti-inflammatory and healing properties, rosewater efficiently eliminates mild scalp inflammation. A regular rosewater massage promotes blood circulation in the scalp. Improved circulation not only enhances the shine and strength of your tresses but also triggers the hair follicles to produce more robust hair. Rosewater massage is also found to be very helpful in fixing the hair loss issue. Add few drops of rosewater into bathing water to get glowing skin. This treatment also relaxes and soothes body and mind. Wash your face with rose water to reduce the skin irritation caused by acne, pimples, redness and breakouts. For dry skin, add some glycerine to rose water and apply it to the skin for some time. Face pack of rosewater and sandalwood will help soothe and refresh the skin. Chilled rose water will soothe sunburned skin. Rosewater maintains skin’s pH balance, calms acne, dermatitis and eczema. Smoothens, hydrates, revitalizes and moisturizes the skin while healing scars, cuts and wounds. Calms the skin to ease stress and anxiety. Helps tone the skin, while offering anti-bacterial properties. Helps revitalize aging skin while keeping fine lines and wrinkle at bay. Mildly soak cotton swabs in rosewater and place it over the eyes to soothe, cool and relax the eyes of fatigue (5). Use fresh rose water as eye drops to prevent and cure dark circles and puffiness. This cleanse eyes in a gentle manner and also calms down the heat. Crush 10 to 15 tulsi leaves and add it to 200ml of rose water. Store this mixture in a spray bottle and in the refrigerator. Now after long tired sunny days you can spray this as mist to calm the harsh sun faced skin. This also helps prevent adverse effects of sun burn while healing skin redness. In this type of rosewater product, you will have to cut beetroot into tiny pieces, dry it in the sun and powder it. Now mix a teaspoon of rose water to this beetroot powder and make your staining lip pack. Wash it off after 15 minutes to achieve an instant soft pink color stain on the lips as well as natural lips color. There are a lot of advantages of rosewater. Make to use it regularly and see the difference!